Home TechBuzz Are Standing Desks Better for Your Health? Are Standing Desks Better for Your Health? Ever since the Internet has become such a juicy place, people have been sitting at their computers a lot more than they used to. The rise in proportion to office jobs means that a large section of the population is spending at least a third of their day sitting down at a desk. We’re standing up and going outside less and less. Regardless of what your opinion about this is, sitting down for extended periods of time isn’t exactly the best thing to do to your body. This is why some folks decided to purchase standing desks, which simply are desks that are usable only when standing up. The question we must ask ourselves now is: are these any better? Sitting down for extended periods of time has been known to be the cause of varicose veins, pulmonary embolisms, and heart disease. Basically, if you’re at your computer all day, expect to live a much shorter lifespan than the outdoorsy folks who go jogging every once in awhile. To battle against the effects of sitting down, some innovators have cooked up a concept known as the standing desk. The marketing behind such a desk says that they’re designed so that you can regulate how much you stand up and sit down, preventing all the ugly diseases that come with just sitting down. Standing up burns more calories (since you’re supporting your weight on your legs) and promotes a healthier blood flow (especially if the chair you’ve been sitting on has sharp edges). But are these claims completely accurate? Let’s have a look at how standing up for extended periods of time might hurt you. If you’re looking to avoid spider veins crawling up your leg, apparently standing up for several hours isn’t going to solve it. Even if the desk you purchase has an adjustable height, are you really going to bother adjusting the height every hour or so? 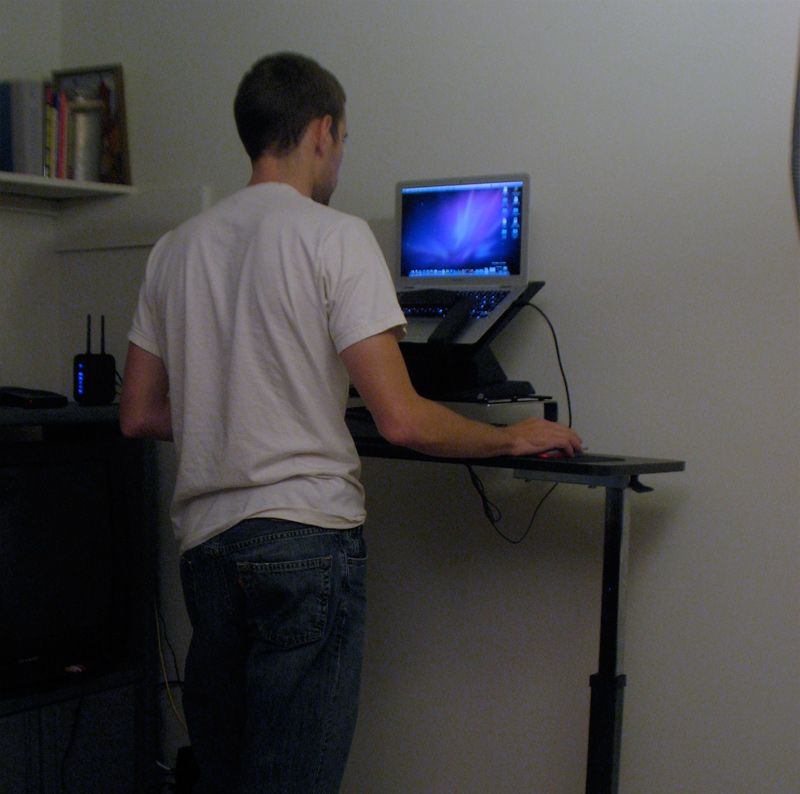 The linked-to study from Cornell University also states that standing desks don’t really help your posture either. You must adjust your posture to be able to lean in towards the screen. Because you are leaning from a standing position, this puts more strain on you than it would from a sitting position. Wrist extension is also an issue, leading to poor wrist posture and eventually a heightened risk for carpal tunnel syndrome (yes, more than you would if you were sitting). The people that the university studied have shown that sit-stand desks are generally not used for more than 15 minutes per day in a standing position. Standing position use declines sharply from the first day, with people eventually abandoning the entire standing concept after one month. Standing for an extended period time also throws off your fine motor capabilities. Since it reduces productivity, it also decreases the value of the work you’re doing (assuming you’re using such a desk at work). All of this happens for just a 20% increase in your caloric consumption. The marketing behind standing desks says that you experience an increase of productivity, which falls flat on its face quite quickly considering the effort required to maintain a standing position for a prolonged period of time. The study at Cornell University regarding standing and sitting that I linked to earlier sums up nicely what you should do to promote a healthier circulatory system: Get up and walk a little every 20 minutes. That’s all you have to do. It’s not very difficult, and more importantly, it doesn’t cost you upwards of $300. WhatsApp Sim to use Whatsapp without Internet !